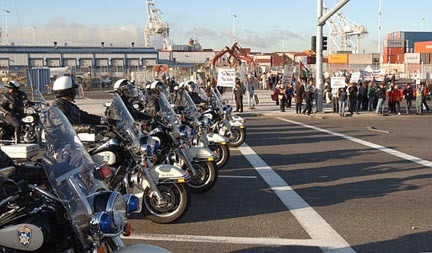 Locked-out longshore workers picket Oakland docks before government imposed Taft-Hartley injunction (October 2002). APRIL 7 – This morning, police launched a brutal assault against antiwar demonstrators and dock workers in the port of Oakland, California, firing on the crowd of more than 500 with shotguns and wounding a number of those present. Six longshore workers were treated by paramedics. The cops were shooting rubber bullets, wooden dowels and bean bag rounds, tossing concussion grenades and using “sting balls” which spray BB-size pellets and a cloud of tear gas. 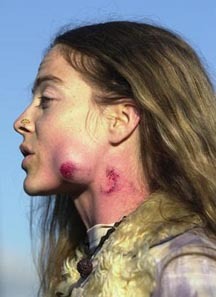 But while police spokesmen insist these are “non-lethal,” dramatic pictures of injured protesters show they can cause great damage. A business agent for the International Longshore and Warehouse Union (ILWU), Trent Willis, said enraged workers walked out after the attack: “They shot my guys. We’re not going to work today.” ILWU Local 10 business agent Jack Heyman was arrested along with 35 protesters and port workers. This shows starkly what imperialist war means on the home front: increasing police-state repression. The Oakland cop attack underlines that Washington’s invasion of Iraq is also a war on U.S. workers, minorities, immigrants, leftists and supporters of democratic rights. According to an AP dispatch, “Police were trying to clear protesters from an entrance to the docks when they opened fire and the longshoremen apparently were caught in the line of fire.” Longshore unionists told The Internationalist that, on the contrary, the police aimed directly at the dock workers. And this is no isolated incident. San Francisco cops arrested more than 2,400 protesters during antiwar marches from March 19 to 22. Moreover, today’s attack was defended by liberal Oakland mayor Jerry Brown, just as liberal SF mayor Willie Brown has backed his cossacks. 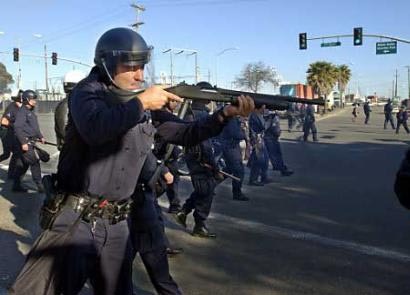 This is reportedly the first time police guns have been fired at protesters during recent demonstrations against the Iraq war, and the first time in a while that cops have shot at workers in the United States. But historical precedents come quickly to mind: the National Guard killing of four students at Kent State in Ohio in May 1970 as they protested the bombing of Cambodia, and the police murder of two striking longshoremen in San Francisco on “Bloody Thursday” in July 1934 that touched off a citywide general strike and was the key event in the founding of the ILWU. In fact, the use of murderous state repression against militant workers and opponents of imperialist war is standard operating procedure for the capitalist ruling class, and we will see more of it as the slaughter of the Iraqi people by the U.S. invaders intensifies. At the same time, brutal cop repression against a key sector of the working class could touch off some serious class struggle, including dock shutdowns against the racist police and the imperialist war. The Oakland police have always acted like an occupying army in this predominantly black and Hispanic city. It was in response to routine racist police brutality that Oakland became the birthplace of the Black Panther Party in the 1960s. Earlier this year, the city agreed to pay $10 million in a suit against Oakland cops who beat suspects and planted drugs on innocent people. The Oakland port has long surpassed San Francisco’s in economic importance, giving black, white, Latino and Asian longshore workers tremendous potential power, which under class-struggle leadership can put them at the head of the region’s workers as well as the impoverished ghetto and barrio population. Today dock workers can play a leading role in sparking genuine struggle against imperialist war and racist repression, with reverberations around the globe. While liberal Democrats wring their hands and beseech the government, this dramatic clash on the Oakland docks should drive home some hard truths about imperialist war. First, that there is no point in begging for “peace” from a government of war criminals who are turning Baghdad into a killing field in their drive to nail down U.S. imperialist hegemony. Appealing to the “conscience” and “morality” of the warmongers who run the United States is worse than futile. The second lesson is that these mass murderers must be defeated, by the only force that has the strength to bring the war machine to a halt, the international proletariat. The capitalist rulers in Washington understand this well. The very brutality of the crackdown on the Oakland docks shows how much they fear the power of the working class. Today’s demonstration on the Bay Area docks was called by the SF-based group, Direct Action to Stop the War, which focuses on various forms of civil disobedience. They called for a “community picket” of American President Lines (APL), headquartered in Oakland, which is a major carrier of war cargo to Iraq; and of Stevedoring Services of America (SSA), an outfit of professional strikebreakers, which has been awarded a $4.8 million contract to operate the port of Umm Qasr in occupied Iraq. (SSA’s big problem right now, according to the Wall Street Journal, 1 April, is that “there are almost no workers to unload ships.”) While Oakland dock workers were being attacked by police, a score of antiwar activists sat down outside the New York headquarters of the Carlyle Group, a major war profiteer, whose board until recently included George Bush, Sr. and whose major investors included the bin Laden family of Saudi Arabia. NYPD riot cops arrested roughly 100 protesters and bystanders. Direct Action demonstrators in Oakland carried signs declaring, “Shut down the War Makers!” But how? Sit-ins are impotent against the armed first of the capitalist state. Longshore workers, in contrast, have the power: send your cops against us, many said today, and we’ll shut the port down! Yet the pro-capitalist bureaucracy that sits atop the unions does not want to take on the war makers and strikebreakers in Washington and Wall Street. The very reason for the existence of this privileged layer of labor misleaders is to conciliate exploited workers with their capitalist exploiters. While the ILWU votes antiwar resolutions, union tops under president Jim Spinosa have blocked efforts to stop the flow of war cargo, going out of their way to move military shipments during the bosses’ lockout last October. In the face of today’s police attack, while seething longshoremen left the docks, ILWU spokesman Steve Stallone declared, “Our contract is that we are supposed to load those ships – and we have every intention of abiding by our contract.” At a labor conference against union-busting last December, called in response to the government’s use of a Taft-Hartley injunction ordering ILWU longshoremen back to work in October, Stallone blew up when an Internationalist Group speaker criticized him for boasting of loading war materiel during the lockout (see “Strike Against Taft-Hartley! Hot-Cargo War Materiel!” in The Internationalist No. 15, January-February 2003). A couple of days later, the Spinosa leadership rammed a sellout contract through a Coast Caucus of the ILWU longshore division. In contrast, many Bay Area dock workers sympathize with protesters against the war on Iraq. The ILWU drill team was prominent in a peace march of 10,000 in Oakland two days beforehand. But such peace parades, no matter how large, are politically bound to sectors of the capitalist (bourgeois) parties. Last Saturday, Democratic Congresswoman Barbara Lee was a featured speaker at the Oakland rally, sounding the “peace is patriotic” theme: “Jobs and housing are the real national security the United States needs, Lee said,” reported the Daily Californian (7 April). Yet Congressional Democrats joined their Republicans colleagues in voting massively for the war, for the $78 billion supplementary war budget, for the U.S.A. Patriot Act intensifying internal repression. Democrat Bill Clinton bombed Baghdad in 1998. This is a bipartisan war of imperialist aggression: to defeat the war and the warmongers, it is necessary to break from the twin parties of American capitalism and build a revolutionary workers party. In fact, the Democrats have been the main party pushing the Maritime Security Act (MSA), a draconian piece of legislation designed to militarize the docks and in the process gut the powerful longshore unions. Hard-won union gains that are key to the strength and very existence of the ILWU, like the union hiring hall, are targeted by the maritime bosses. While outfits like SSA set up their lucrative operations in U.S.-occupied Iraq, as the Nazis’ Todt Organization did in German-occupied Europe in World War II, they offer their scab-herding services to U.S. bosses. But a determined class-struggle offensive by West Coast longshoremen could bust these union-busters, turn anti-labor laws like Taft-Hartley and the MSA into dead letters, and strike a damaging blow against the imperialist war machine. In recent weeks, after the dramatic actions by British and Italian railroad workers in January and February, various reformists and centrists have made limp calls for stopping (or more frequently, protesting) the transport of war materiel. But these calls lead nowhere: they only want to add a militant-sounding “labor” component to the “popular-front” peace coalitions and have no intention of challenging the capitalist system. In contrast to the empty calls of these class-collaborators and conciliators, the Internationalist Group and the League for the Fourth International, have sought to implement our calls for mobilizing working-class power against the war. The February 21 worker/immigrant demonstration initiated by the LFI at the Rotterdam docks in the Netherlands is a modest example. In Mexico, our comrades of the Grupo Internacionalista have fought for strike action against the war, holding a protest rally March 27 with unionists of the Metropolitan University (UAM) in Mexico City on the slogans “Defeat the Imperialists! Defend Iraq! For Workers Actions Against the Imperialist War!” They GI also led the shutdown of a secondary school connected to the National University (UNAM), and led delegations of 30 students each from the UNAM which visited electrical and oil workers’ job sites to talk about the need for strike action against the war. In Brazil, the Liga Quarta-Internacionalista do Brasil is agitating to include the call to defeat the imperialist war among demands of a public workers strike in the state of Rio de Janeiro, and in a national work stoppage against the anti-worker “pension reform” ordered by the popular-front government of Luiz Inácio Lula da Silva at the insistence of the International Monetary Fund. At the initiative of the LQB, the Rio teachers union, SEPE, has called a statewide work stoppage for April 23 demanding freedom for Mumia Abu-Jamal, the radical black journalist and class-war prisoner, who has raised his powerful voice from death row against the war on Iraq. In the U.S., the IG has intervened on ILWU picket lines (during last October’s lockout) and in meetings against the Taft-Hartley slave labor law and the war, insisting on the need to break with the capitalist parties, ditch class collaboration and forge an internationalist workers party that can lead the class struggle to victory. At this moment, building active solidarity with the West Coast longshoremen, once again in the crosshairs of the war makers and strikebreakers, and fighting for workers’ action to stop the war cargo on the docks, is a key step in waging class war against the imperialist war. Drop all charges against the Oakland longshore and antiwar protesters! Rip up anti-union laws and fight war repression through workers action! For workers defense against anti-labor attacks! “Hot cargo” all war materiel! Strike against the imperialist war! Break with the Democrats, dump the bureaucrats, forge a class-struggle workers party!